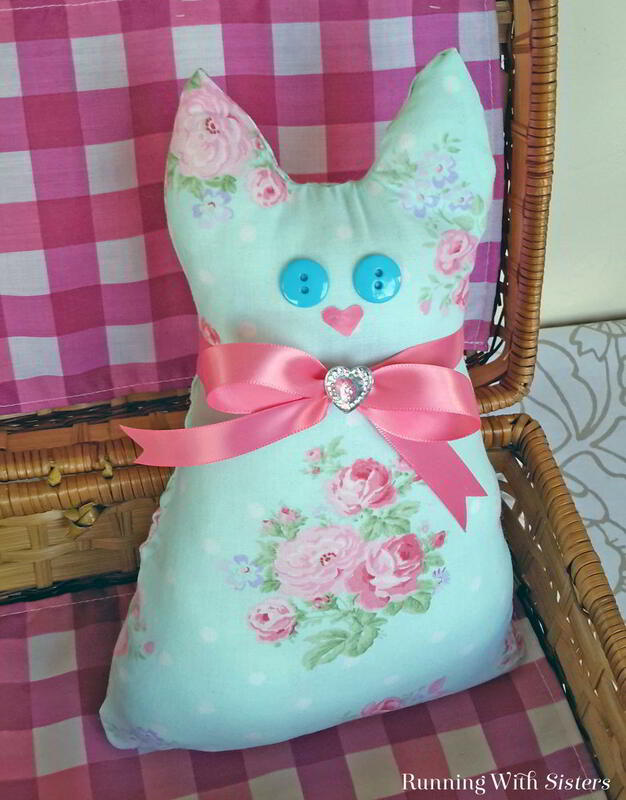 Here’s a cute no-sew craft: A Calico Cat Pillow or Doorstop! We tested all the fabric glues we could find and discovered the glue that works best. Plus we have a tip to turn the pillow into a doorstop. 1. Wash, dry, and iron the fabric. This is a really important step! We tested glues on unwashed fabric and the pieces easily peeled apart. Once we washed the fabric, most glues held well. But in our test, Aleen’s Fast Grab Tacky Glue worked the best. Even better than glues labeled as fabric glues! 2. Print out the template and cut it out. 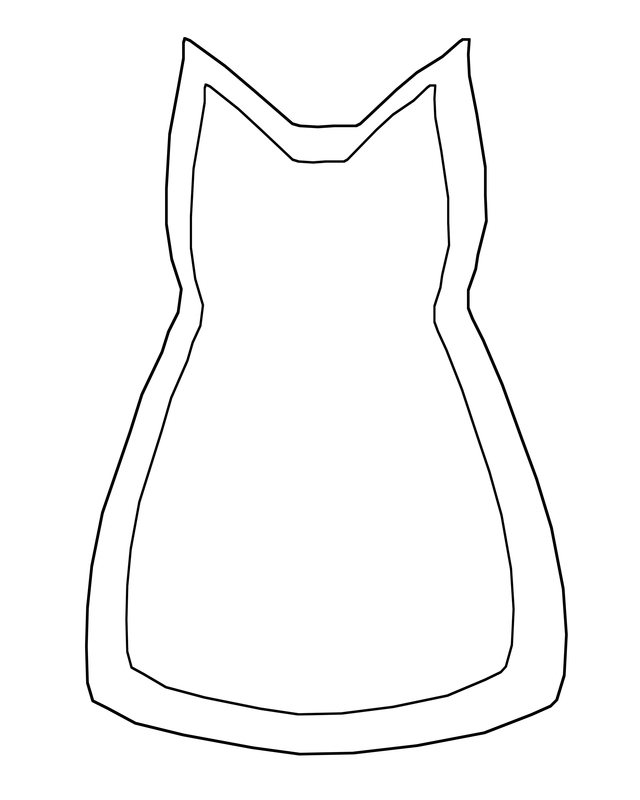 Cut two pieces of fabric using the template. 4. Turn the fabric right side out. Stuff the cat pillow with poly-fil. We overstuffed ours a little and like how that looks. 5. Glue the opening closed by turning the hem inside and lining it with glue. Pin it closed until it dries. 6. Glue on the eyes. Cut a nose from pink ribbon. Glue it on. Tie a pretty bow around the cat’s neck. Glue a crystal heart onto bow. Here’s the template we made. Feel free to download it, print it, and use it! To turn the pillow into a doorstop, place a bag of sand in the bottom as you are stuffing it with polyfill. We tried a few different bags and preferred the very cheap fold-over sandwich bag because it is so thin and flexible. We filled the bag with sand and closed it with a rubberband. Hi girls! Sweet cat. I’d like to pin this but I can’t find on the page the “pin” button. Please tell me where it is. I got this from your emailed newsletter. I had this problem before on your site. I’m sure it’s just me! I’m not the most observant person. Hey. How come there are never any comments after the post? Anyway, love your ideas and passed your site on to my sister! Hi Kathleen! Thanks for the positive words! If you hover over any picture in the post, a set of buttons should appear in the upper left corner. It’s a P for Pinterest button, an F for Facebook button, and a birdy to tweet the project. We have included a Pinterest friendly graphic at the end of the post with words on it. 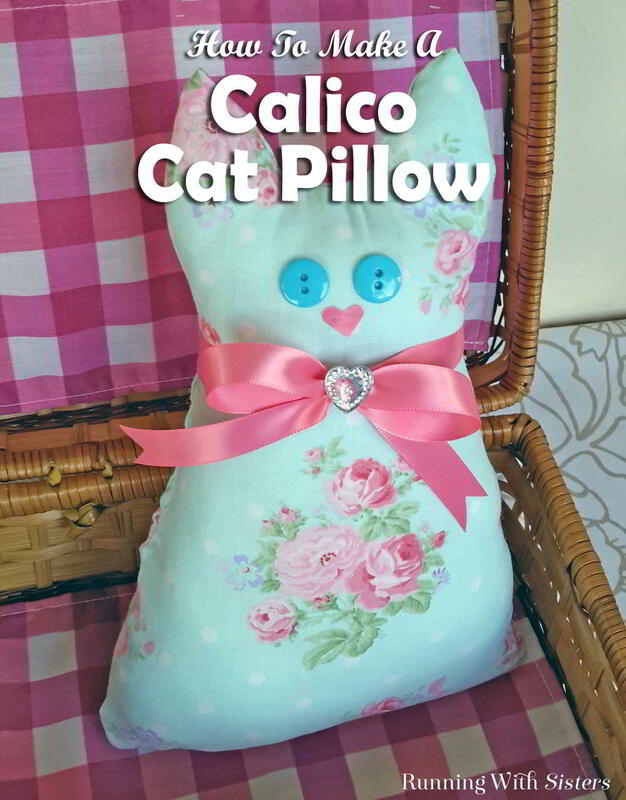 “How To Make A Calico Cat Pillow” Please let us know if that doesn’t work for you.